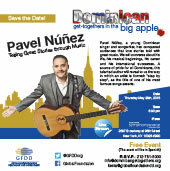 The famous singer and songwriter Pavel Núñez, a young Dominican who conquers audiences with love stories and great music, will be participating in the 4th Dominican Get-Together of this year, an initiative of Global Foundation for Democracy and Development (GFDD), on Thursday, May 28 at 6:30 p.m. in New York City. In this talk, entitled “Pavel Núñez Telling Great Stories through Music”, the young Dominican artist will share his experiences throughout his musical career. The audience will have the opportunity to converse with him about his life, musical beginnings, and international successes. A source of pride for all Dominicans, this talented author will reveal to us the way in which an artist is formed: "step by step", as the title of one of his most famous songs asserts. “The mission of Dominican Get-Togethers is to promote understanding and appreciation of Dominican culture, values, and heritage, and create opportunities for discussion on contemporary issues that are relevant to Dominican society both in the homeland and abroad,” said Natasha Despotovic, executive director of GFDD. Dominican Get-Togethers are hosted throughout the year and make things such as Dominican movies, prominent figures, and discussions available to wide audiences in the New York metro area. This event will be held at Peter Norton Symphony Space, located at 2537 Broadway 95th Street, New York. This Dominican Get-Together is free and open to the public, and will be held in Spanish.